If you have a little cute daughter at home and you have been looking for some fun then you are on the right page. This photo editor on the photomica is special and you can just make your daughter happy by clicking her photo and making her a little mermaid. This can be a great past time with your daughter. Sit with the tiny tot on your laptop and tell her how can she look when you create different pictures of this little wonder with your photo editor. 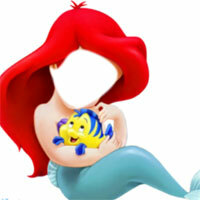 There are many other funny characters along with this Ariel Templates Fun.